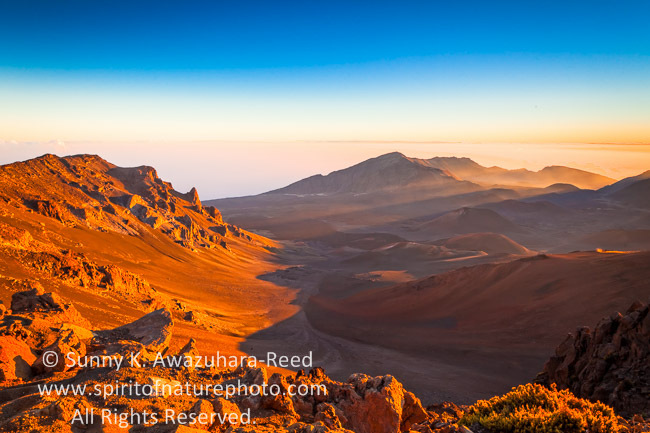 The summit of Haleakala Volcano rises 10,023 feet above sea level on the Hawaiian island of Maui. 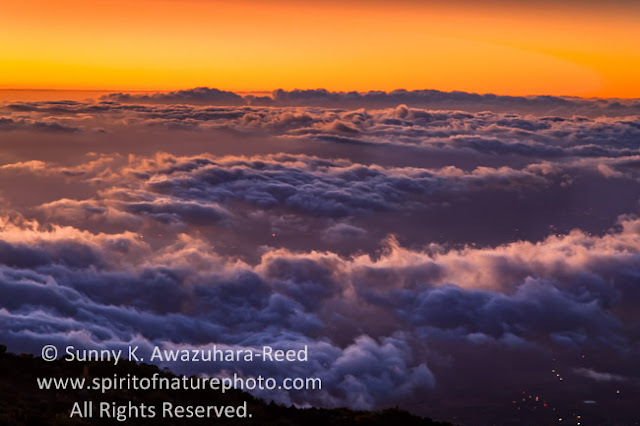 It is said, viewing the sunrise at Haleakala Summit is "most memorable" and a somewhat spiritual experience. 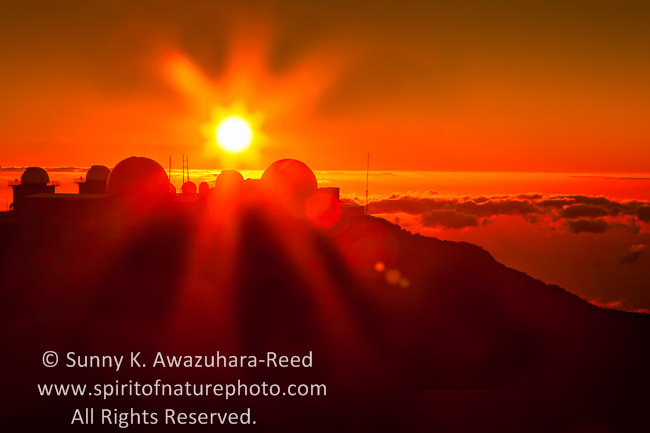 As a nature photographer, I was thrilled to capture the spectacular sunrise at Haleakala Summit. Arriving at Haleakala Summit more than a half hour before sunrise, the large parking lot was already almost full! Hundreds of people were already standing and waiting at the edge of the crater where the sun was supposed to come out... The cold gusty winds was blowing across the arid volcanic crater, and the tourists were shivering in hotel blankets... I was wearing Alaskan winter clothing which I wore from home to the airport. The sky was still dark with millions of stars. When I set up the camera gear at the edge of crater, the sky was starting to get lighter. The ocean of clouds were spread beyond the crater... 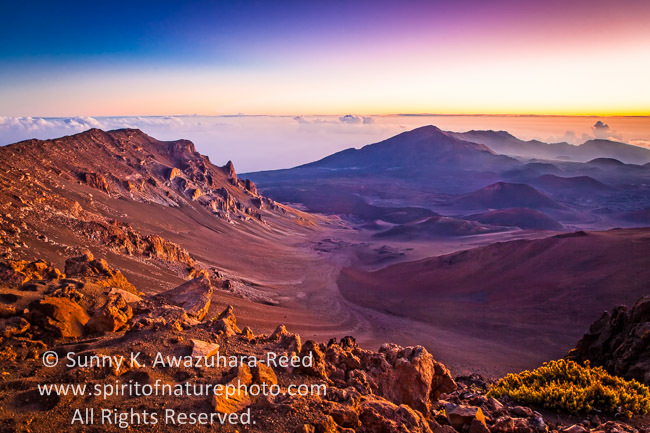 The reddish volcanic rocks were mysterious purple under the light of dawn. A group of Hawaiian women chanted in their local language as the sun continued to rise. "House of the Sun" in Hawaiian language, Haleakala is an ancient sacred place for Volcano goddess, Pele. The sky slowly lightened up above the cold, windy crater... The background chanting keep going... Finally, the bright sun came out above the clouds. The sky was reddish orange! 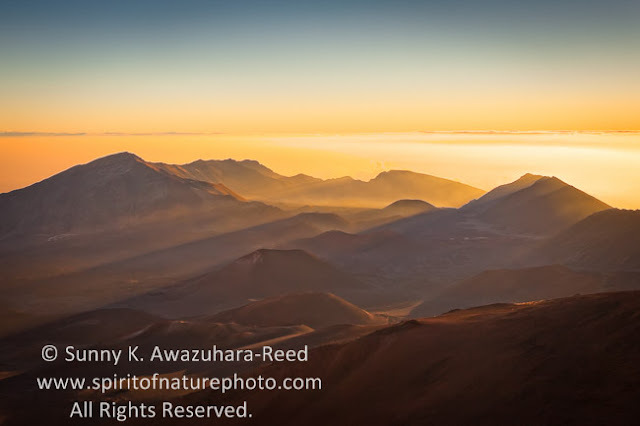 As sun goes up, the warm light painted the crater in golden orange. Now the volcano landscape comes alive. The crater and volcanic cones. 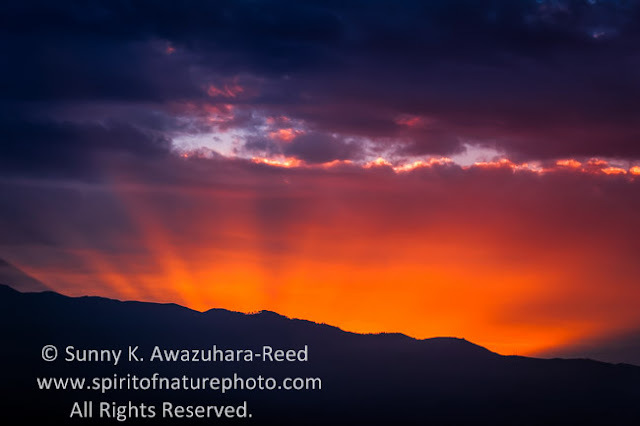 The colors of the landscape and sky changed every moment! The sunrise was dramatic but quick... and COLD. 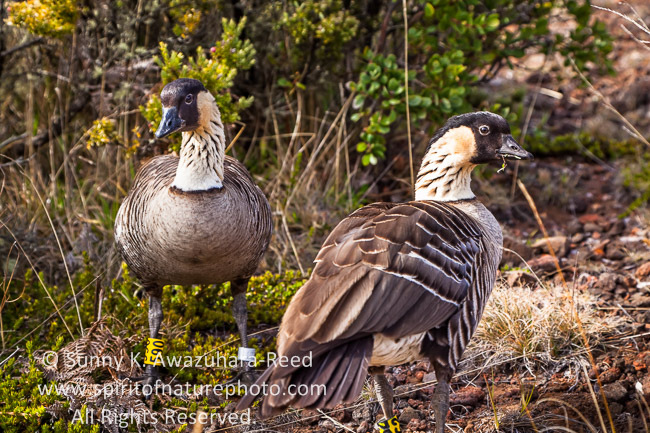 The endangered Hawaiian bird: Nene were hanging around in the lower elevation in the park. ﻿Here are Haleakala Summit sunset from the night before... Sunset behind the Observatory. Flaming clouds at Summit area at sunset. Another sunrise over Haleakala. 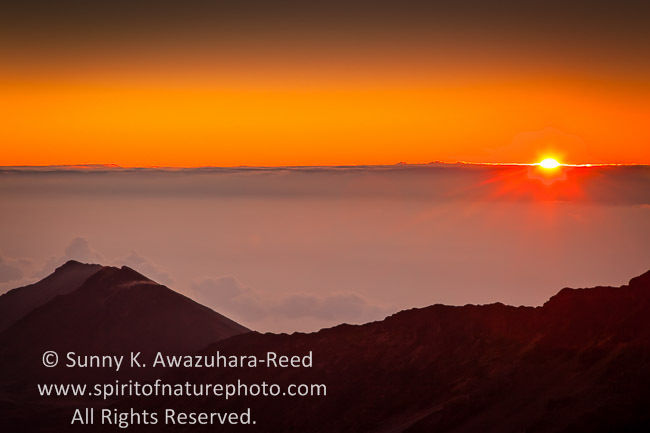 Sunrise rays above the Haleakala Summit, viewed from the ocean. 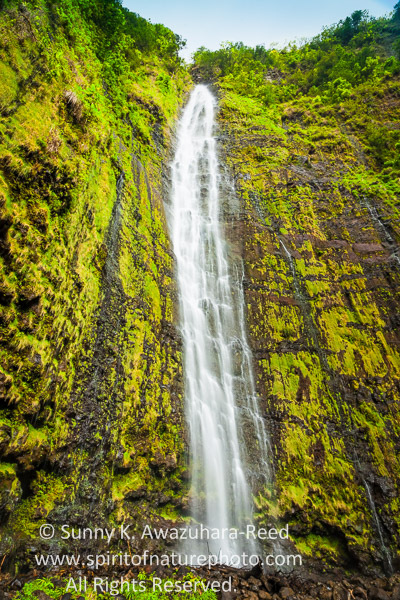 Last December, I explored the natural beauties of the Island of Maui, Hawaii. 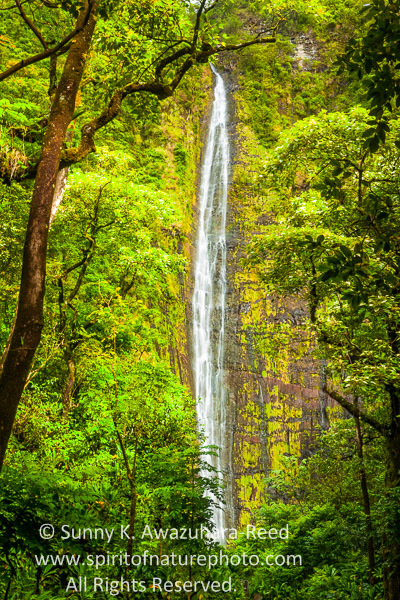 In photographing Hawaii, I am especially fascinated with the tropical rainforests and waterfalls. 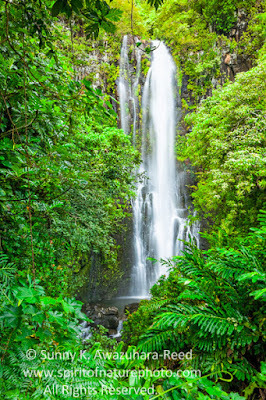 Driving through the town of Hana, the tropical green landscapes continued through to the southeast part of the island. As part of the Haleakala National Park system, the Kipahulu area is a real gem; breathtaking waterfalls, natural pools, bamboo forests, and coastal views. 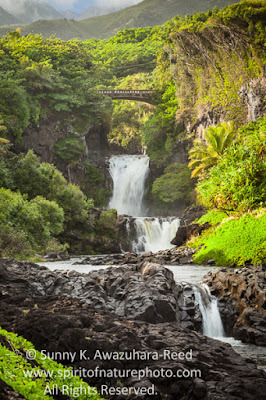 Wailua Falls, full of water after a heavy rainfall. 'Ohe'o Gulch ("Seven Sacred Pools") waterfalls cascading down volcanic cliffs with tropical vegetation down to the coast. Maui is home to bamboo... a large part of East Maui is covered with bamboo forest! 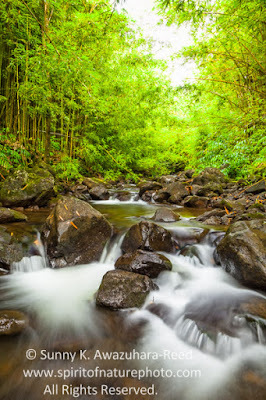 The trail in this part of Haleakala Park begins with typical jungle images with banyan trees and thick greens... A creek cascading down creates some waterfalls along the trail. As I climbed higher and crossed several bridges, the vegetation changes to bamboo. The bamboo forest gets thicker and thicker... almost completely blocking out sunlight. The trail gets even darker at mid day. 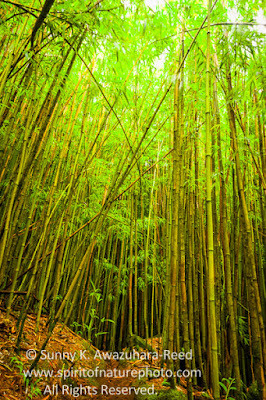 The breeze and rain blows the tightly packed bamboo and creates clacking sounds in dim green colors. 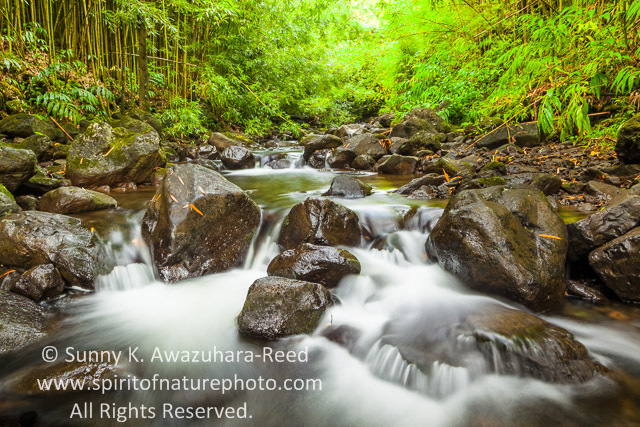 Sounds of water streams are mixed in. Capturing this atmosphere, I had to set the shutter speed for 13-15 seconds with tripod in the low light. The wind swing the thin green stalks... It was hard to get sharp images. 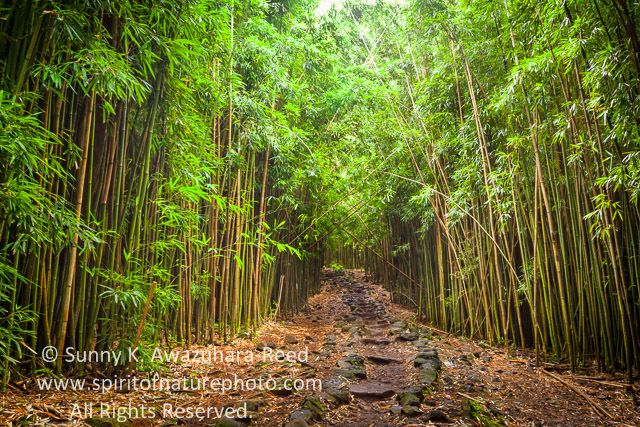 Walking through the bamboo forest in rain was somewhat a spiritual experience... I had never felt this way when I was back in Japan among the bamboo forests there. "Zen" mind experience!? Waimoku Falls dropped off a vertical cliff of 400 feet! Such an amazing end to the trail! For the next posting, I will post some sunrise and sunset photos at Mount Haleakala Summit in Maui, Hawaii. Please check back in 2 weeks!